Use the form below to inquire about Heritage Mansion At Kanadukathan . Use the form below to reserve for Heritage Mansion At Kanadukathan . Go back in time at this Heritage Mansion at Kanadukathan and experience the Chettinad lifestyle in luxury and comfort. Kanadukathan has been declared a heritage village due to the dense concentration of Chettinad heritage buildings. All the Chettinad mansions here were built by the Chettiars, a community of rich businessmen. A stay at this Heritage Mansion at Kanadukathan opens the doors to a rich Chettiar lifestyle. This Heritage Mansion at Kanadukathan, constructed in 1902, is one of the largest mansions in the region. 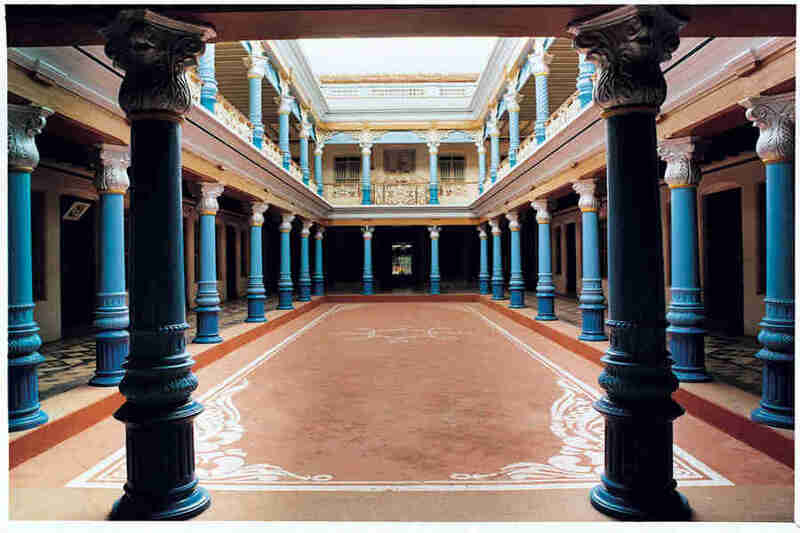 Spread over 80,000 square feet, this huge structure has a splash of beautiful colors in its massive pillars while the black and white checkered tile floor is a signature style of Chettinad mansions. The huge arches and double height ceilings are characteristic of Chettinad architectural uniqueness passed down over generations. The owners of the mansion live on site and help acquaint you with the culture and history of the property and the Chettinad region. The antique museum here houses priceless reminders of the past. Chettinad cuisine, renowned for its right blend of heavenly spices, is prepared by authentic chefs and guests are welcome to take cooking lessons. Plastic is not allowed on the property and room service for food is not encouraged. The Ayurveda center on the property is perfect for some rejuvenation while the outdoor swimming pool is a great spot to lounge with books from the library. Only 12 rooms are open to guests, extending extreme privacy. Every room has a vast private balcony that opens up to the sceneries of the beautiful village. Though rooms in this Heritage Mansion at Kanadukathan are furnished with modern comforts, interior details are preserved in the same way as it was a century ago. Old style air conditioners and wall paints with designs adorn the room interiors with pride. A stay at this mansion is sure to help you enjoy a slice of life from a bygone era. Meals according to the package chosen. Kanadukathan is a laid back village with a rich past of history and culture. Taking a bicycle ride or a bullock cart ride through this village will leave you mesmerized. These can be arranged as and when you want them. Pillayarpatti Temple, a rock cut shrine with Lord Ganesha and Lord Shiva, is a popular attraction as is the majestic Thirumayam fort that is maintained and administered by the Archaeological Survey of India (ASI) because of its historic link with the Polygar War. Set out on a visit to Athangudi tile factory, where eco-friendly tiles are handmade on glass using natural colors and soil. This technique dates back to 200 years and these tiles were an important element of the Chettinad mansion floors. A visit to weaving centers where Chettinad cotton sarees, popular for their color splash and the quality of cotton, will reward you with an enlightening experience. The diamond traders of Karaikudi and Kanadukathan have been trusted and favored by the Chettiars over centuries and you can shop for jewelry if you’d like. Antiques and handicrafts found in the local markets make for great souvenirs too. Situated at a distance of 73 km, Trichy is the closest airport while Madurai airport is around 100 km away. Kempegowda International Airport, Bangalore, is at a distance of 452 km. Chettinad railway station is only 1.5 km away while Karaikudi Junction is 15 km away. Pudukkottai railway station is 33 km away while Bangalore railway station is 425 km away. Karaikudi is 15 km away and is accessible via two routes. Trichy is around 78 km away along NH336 while Rameshwaram is at a distance of 156 km. Bangalore city is around 420 km away.